Jewelry markings tell you the percentage of gold in each item. Federal law requires that gold jewelry sold in the United States must be marked with the gold content. 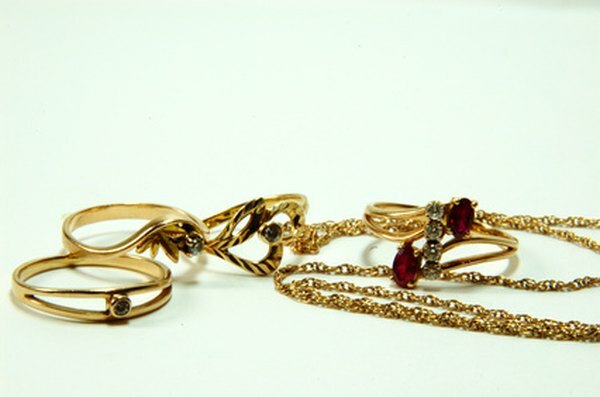 The U.S. jewelry industry has standardized the marking of real gold items through Voluntary Product Standard PS 68-76. The jewelry manufacturer bears the responsibility and legal liability for ensuring the actual gold content is what the marking indicates the gold content should be. The gold content of jewelry made of gold alloys is expressed in karats. Pure gold is 24 karats. But U.S. jewelry manufacturers generally don't make their products out of pure gold. They alloy gold with a harder metal such as copper to make the jewelry more resistant to wear. Gold jewelry sold in the U.S. typically is 10, 12, 14, 18 or 22 karat, marked with the number followed by a letter K . The mark -- for instance, “14K” -- typically is stamped on a place that doesn’t show when the jewelry is worn, such as the inside of a gold ring or on the clasp of a gold necklace. A piece of gold alloy jewelry marked 10K contains 41.67 percent gold, a 12K item is 50 percent gold, a 14K piece contains 58.33 percent gold, an 18K item contains 75 percent gold, and a 22K item contains 91.67 percent gold. A piece of jewelry made of a gold alloy below 10K cannot legally be sold as “gold” jewelry in the U.S. even if marked with the karat gold content. The manufacturer or seller must call the alloy by some name other than gold. For example, Tiffany & Co. in 2012 introduced jewelry made from a low-karat alloy that it trade-named Rubedo. This golden-red alloy contains only 31 percent gold, equivalent to 7.5 karats. Is the New York Stock Exchange the Largest Stock Market in the World?